The University of Aberdeen (Scotland) hosted a comprehensive three-day counselor tour, providing invaluable information regarding their programs, facilities, students and faculty. Aberdeen is a very vibrant and international city, in large part due to the university and the development of natural resources offshore. Approximately 20 percent of the students are international, with North American sending the most students. Scholarships are available for North Americans, with additional discounts their final year if students do well. Unlike other UK universities, students select a major after the end of their second year, even though they have to identify an area of focus on the UCAS application. US Students may apply using the Common Application. Flexibility is a key differentiator at the University of Aberdeen, although it is more difficult to switch between sciences and arts. The Enhanced Study Program is a core requirement of courses taking students out of their comfort zone via interdisciplinary study. For example, engineers may take courses to understand the environmental impact of road-building including biological, sociological, and economics impacts. 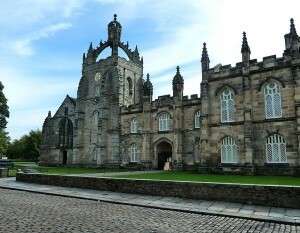 During students’ first and second years, 25 percent of courses are outside their area of study, reflecting the University of Aberdeen’s embrace of the liberal arts model. Most courses are team taught so that students get a variety of perspectives. Students take four courses per semester and may double major as well as major and minor. More information is available on UCAS.tv. Decisions are made primarily on the results of standardized tests as evaluating GPAs at US high schools is challenging because of the diverse range. Minimum SAT requirements and details of tests accepted are available here. All applications also go through a plagiarism review. Top programs include divinity, French, anthropology, sociology, and history. Other offerings include forestry, bio-medical engineering, petroleum engineering, and nutrition. A unique program includes Gaelic, Scottish, and Celtic Studies. Students apply as first-year students to a particular college and, unlike the UK model of three years of university, the University of Aberdeen offers a four-year degree. Applications are available through UCAS or the Common Application; however, deadlines vary depending on the application used. Admission is offered on a rolling basis. Accommodations for students with learning disabilities (10 percent of students identify) are available, and they recommend sending documentation ahead of matriculation. We toured the excellent new athletic facilities, which are some of the best in the UK. Students often play golf, and courses are abundant. Scholarships are offered for athletes as the University of Aberdeen is actively trying to build its teams, a new concept at UK universities. Crew, swimming, and diving are popular. This historic and energized campus attracts students from all over the world. 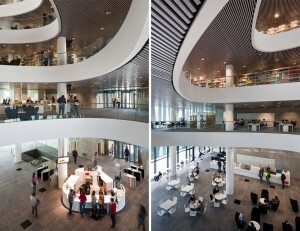 Businesses provide considerable support with research and internships at the University of Aberdeen. International students may work twenty hours a week in Scotland, providing invaluable internship and financial support for many. I was able to get an independent tour of the engineering facilities, which were very impressive. A five-year Masters Program is offered for engineers. The campus is expansive, and for students looking for access to airports throughout Europe and a true international experience, the University of Aberdeen is a great choice.